It’s hard to say what might be the ‘best sewing machine in the UK’. Sewing machines – like people – come in all shapes and sizes and they’re all good and bad at doing different things and they all have different purposes. However, for basic sewing, you can make a definite distinction between good and bad sewing machines depending on what level you’re at in your sewing. So, in order to give you a good idea about the best sewing machine for you, he’s a list of some of the best sewing machines for beginners, intermediates and professionals. When you’re a beginner your main priorities when finding the right sewing machine are to make sure that it’s easy to use, is priced reasonably and that it has enough complexity to keep your learning. 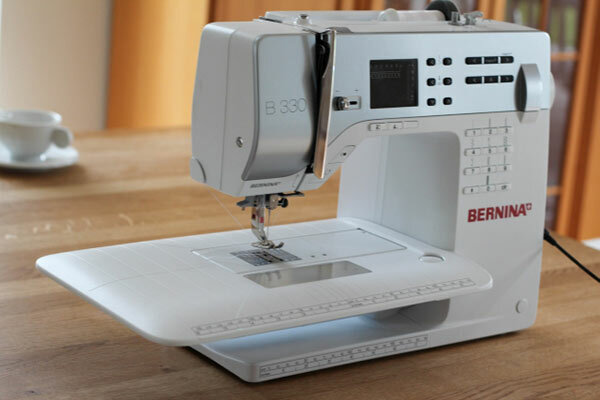 Well, one of the best machines on the market to help you with these things is the Bernina B330. In terms of beginners’ sewing machines, it’s priced on the upper side of the scale but if you have any intention of taking up sewing as a regular hobby (or career) and improving then this is a great tool. It’s simple enough for a beginner to use but also has enough additional features for you to experiment with and learn new techniques. It has a permanent memory function for you to save different sewing patterns, which will save you from having to keep resetting it and fiddling with it when you want a specific result. It also has a built in automatic needle threader and can make button holes automatically, too. It has 24 different stitches for you to experiment with and master and a jam proof drop in bobbin. This is a machine you can keep using for years – even as an intermediate sewer – and will be a loyal friend to you as you learn to master your skill. Regrettably, this is another pricey machine, but definitely worth it. Elna sewing machines are perfect for intermediates making the transition into professional. It shares a lot of its features with the Bernina, so you wouldn’t have too much trouble getting used to it. The main difference is that the Elna has even more features for you to mess around with. It has 50 different stitches for you to choose from including quilting, which is great for anyone that’s interested in taking their sewing in that direction but doesn’t know much about it yet. You can adjust the speed and tension. It has an automatic needle threader and thread cutter. It also has an LED screen that displays the stitch number, width and length. If you want to learn more about the technical side of sewing then this is the perfect machine for you. The Brother SE400 is a computerised machine that’s brilliant for sewing, embroidery and even quilting. The price isn’t nearly as high as you would expect it to be and it has a lot of great features. It has 67 built in sewing stitches, 70 embroidery patterns and 5 lettering fonts. You can download even more online and upload them onto your machine, which gives you almost limitless options. It’s got all of the automatic features that you need (threader and cutter) and you can download additional software for it. You won’t find anything else like it on the market and, once you buy it, you won’t need to look anywhere else anyway. It has everything you need for every type of sewing. Next: Should I Buy an iPhone 7 Or a Galaxy Note 7?